(Blaze II#11) - The Punisher came to Blaze's aid against Charnel, Joy and Dolores. His bullets held them back long enough for Blaze to reload his Hellfire shotgun. After a hail of bullets rained down on the vampires and blew up the surroundings around them Charnel and his girls decided to return to their hideout. They jumped through a window to the outside and drove off on their motorcycles without Roadkill and the others, which Charnel didn't bother much. Back at their base Charnel ordered Hairball, Blivet and Roadkill to move Uri-El's box to a more tactically advantageous position despite Shelob's wish to keep him to lure Blaze to her. Blivet accidentally moved the chains on the box, breaking the magic seal and releasing Uri-El. The heavenly creature cut off Hairball left arm, cut Blivet's head in half and stabbed Roadkill, who he burnt with eternal flames. While Charnel shouted around orders Uri-El was finally overpowered and webbed up by Shelob and put back in the coffin by Dolores and Joy. Shelob remade the seal to trap Uri-El once again. 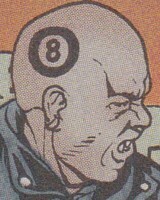 Charnel told his crew how Uri-El reduced the numbers of vampires each time he was released (thirteen times) and needed to be destroyed once and for all. Only moments later Blaze, Punisher and Clara arrived at their hideout and took a few shots at the vampires. (Blaze II#12) - Joy and Dolores wanted to release Uri-El again so Blaze could destroy him, but Charnel reminded them that Blaze needed to wield the Hellfire against Uri-El out of righteousness for it to work. Blaze shot the box and released Uri-El, who was immediately targeted by the Punisher and Blaze because they didn't know Uri-El was actually the good guy and only saw him as a threat. After Uri-El's seeming destruction by Blaze's Hellfire Charnel and his vampire cronies celebrated, but before they could go after Blaze and the Punisher a portal opened behind them and the Wendigo came through with Jesse Pinto and Blaze's kids. Wendigo attacked Charnel, Joy and Dolores and Craig Blaze branded Charnel with the No. 7 Nail File, which weakened Charnel severely. Because it hurt so much Charnel stretched his arm to get Craig, but Johnny shot him for touching his son. Charnel was immune against the Hellfire after Uri-El's destruction and destroyed the weapons of Blaze and the Punisher before ordering the other vampires to feast on their enemies. Dolores and Hairball overpowered Blaze, who got hold of Uri-El sword and cut them in half. Joy and Blivet were cut in half next and finally Charnel found his demise when Blaze stabbed him through the chest. The sword's purifying energies slew Charnel. The Undead MC were now in bits and pieces and history! Comments: Created by Larry Hama (writer) & Gary Erskine (artist). BTW Uri-El got better shortly after seemingly being destroyed by Hellfire....actually two after the Undead MC were history Uri-El was back and Blaze handed over the sword to him. 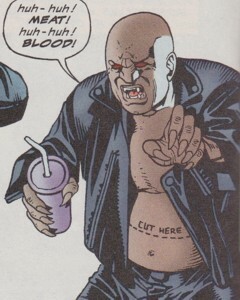 The real names for all members were revealed in the vampires appendix in Vampires: The Marvel Undead#1 (December, 2011). It seems like the powers of Dolores' tattoo and the Kristall Starrer's eyes where on a similar wavelength. It would explain how the Eyes' energy was released through Dolores' tattoo. In Blade III#12 a prophecy was fulfilled that brought back all vampires that ever died. This most likely included Amenhotep as well. We'll have to wait if he resurfaces. He was just a fat vampire with regular vampire abilities and weaknesses, though he could survive his head being cut in half from the top. (Blaze II#10) - Blivet helped dig up Uri-El's coffin and asked Hairball and Roadkill about Dolores' magic tattoo. Afterward he pushed the coffin to Shelob and ran away from her like a scared kitten. That night he rode the highways of New Jersey again and after Charnel's plan lured Blaze and his friends to the Dark Pavilion Blivet participated in the assault on Clara, Kody, Princess Python and Wolf outside the pavilion. Blivet, Hairball and Roadkill eventually fled from them into the pavilion. (Blaze II#11) - Blivet, Hairball and Roadkill returned to the hideout and Charnel ordered them to move Uri-El's coffin. Blivet accidentally broke the coffin's seal by moving the chains and released Uri-El. He got his head split in half from the top by Uri-El, but survived. After Shelob had caught and trapped Uri-El again Blivet listened to Charnel telling them that Uri-El needed to be destroyed because each time he was released he reduced the numbers of vampires on the world significantly. Moments later Blaze, Punisher and Clara arrived. (Blaze II#12) - Blivet was run over and shot by Blaze and the Punisher. After Uri-El's seeming destruction Charnel ordered Blivet and the others to feast on Blaze and the Punisher. Blaze got hold of Uri-El's sword and cut Blivet in half, destroying him. (Blaze II#11 (fb) - BTS) - Charnel became a vampire some time before Suleiman's reign (in 1520 AD). He witnessed how Uri-El had been released upon vampirekind for the first time and how he was trapped by a vampire mage in the valley of the Euphrates. It is unknown if and how many times Charnel was present during the subsequent thirteen times the seal for Uri-El's coffin needed to be renewed. (Blaze II#10 (fb) - BTS) - In the modern era Charnel worked as a big time heroin dealer in the New Jersey area, gaining the Punisher's attention. (Blaze II#10) - Charnel and Joy looked at Dolores' tattoo, which showed their target Johnny Blaze. Charnel had to remind Joy that she couldn't taste Blaze's blood until Blaze fulfilled his purpose (slaying Uri-El). Charnel wasn't pleased with Hairball, Blivet and Roadkill pushing around the coffin containing Uri-El and told them to just give it to Shelob so she could guard it. Shortly after Charnel led the Undead MC back to the streets of New Jersey on their bikes to hunt for blood. Charnel was confident they would soon be free to roam the Earth again after Blaze took out Uri-El with Hellfire. During the ride Charnel touched Dolores' ever-changing tattoo and was hit by an energy blast released from it (it was the light from the Kristall Starrer's eyes, which Clara Menninger was using). Losing control over his bike Charnel was run over by a van. He got up and the worried female driver of the van, who had stopped to help, became the Undead MC's victim. Charnel used her blood to lure Blaze and his friends to the Dark Pavilion. Blaze took the bait and soon arrived at the pavilion with Kody, Clara, Princess Python and Wolf at his side. While Blaze entered the pavilion the others fought Blivet, Hairball and Roadkill outside. Charnel with Joy and Dolores at his side rode a bumper car to the carousel to welcome Blaze, who shot the vampires with Hellfire. Charnel and his girls survived and overpowered Blaze. (Blaze II#11) - The Punisher came to Blaze's aid against Charnel, Joy and Dolores. Though his bullets couldn't hurt them they ultimately fled back to their lair after taking a barrage of bullets from the Punisher and Blaze. Hoping Blaze would follow them Charnel and his girls jumped through the pavilion's windows to the outside to ride back to their hideout on their bikes. Back at the overpass Charnel ordered Hairball, Blivet and Roadkill to move Uri-El's coffin to a more advantageous position, but when Blivet accidentally released Uri-El Charnel panicked. After Shelob had contained Uri-El again Charnel told the story of how Uri-El had been his kind's bane since before Suleiman's reign. Moments after the coffin's seal was renewed by Shelob Blaze arrived with Clara and the Punisher. (Blaze II#12) - Charnel, Joy and Dolores guarded Uri-El's coffin to lure Blaze into shooting it. Charnel's plan worked and he finally witnessed Uri-El's seeming destruction by Blaze's Hellfire. Charnel only had time for a short celebration because moments later the Wendigo arrived through a portal with Blaze's children and Jesse Pinto. The Wendigo beat on Charnel and Craig Blaze used the magical No. 7 Nail File to brand Charnel, which weakened the vampire. Charnel assaulted Craig for the pain he had caused him, but Craig's father Johnny Blaze shot Charnel for the attempt to harm his son. But without Uri-El Charnel wasn't weakened anymore and easily took apart the weapons of Blaze and the Punisher. Blaze ultimately used Uri-El's sword against the vampires and Charnel went up in flame when Blaze stabbed him through the chest. 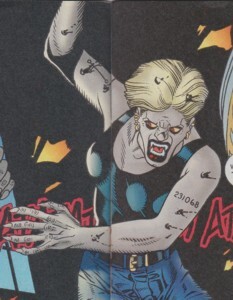 Dolores had the normal powers and weaknesses of a vampire though she was pretty much immune to fire. She also possessed the powers of clairvoyance, which was channelled through a tattoo on her back that always showed the future. (Blaze II#10 (fb) - BTS) - At some point in the past an Egyptian sorcerer made a mystic tattoo inside a pyramid on a full moon on Dolores' back. The tattoo always showed future events. (Blaze II#10) - Dolores' tattoo showed Johnny Blaze, who was needed by the Undead MC to destroy Uri-El. Dolores bit Joy's finger and told her that Blaze's doom was written on her back and that they would soon feast upon him. Charnel reminded the girls that Blaze first had to destroy Uri-El for them. Dolores told the Undead MC that Blaze would not come alone and that there would be enough people to feast on for them. When Blaze came ever closer her tattoo shifted again. She joined the others on their motorbikes on the New Jersey highway where her tattoo suddenly showed the Tetrarchs of Entropy and then released an energy blast (sent from the Kristall Starrer's eyes, used by the Quentin Carnival's clairvoyant Clara Menninger), which hit Charnel. Dolores was in shock when a van ran over Charnel, but the driver soon became the Undead MC's victim and their way to lure Blaze to the Dark Pavilion. Dolores, Joy and Charnel waited on a bumper car inside the pavilion. When Blaze encountered he shot the vampires with Hellfire, but they quickly got up again and overpowered him. (Blaze II#11) - Aided by the Punisher, who was after Charnel, Blaze put Dolores, Joy and Charnel to flight after bathing them in a barrage of bullets and Hellfire pellets. Charnel and the girls fled to their hideout. Only Dolores was worried about Roadkill and the others, but they soon returned to their hideout as well. When Blivet accidentally released Uri-El Dolores and Joy pushed Uri-El back into his coffin after Shelob webbed him up. Dolores asked Charnel why they didn't just drop Uri-El in a bottomless pit. Charnel replied with the story of Uri-El and how many times he had escaped before, which was the reason why he had to be destroyed. Shortly after Blaze, the Punisher and Clara arrived. (Blaze II#12) - Joy and Dolores wanted to release Uri-El so Blaze would destroy him, but Charnel reminded them that Blaze had to do it out of righteousness for it to work and they guarded Uri-El's coffin, which Blaze shot at. Uri-El was released and got into a fight with Blaze and the Punisher. The former seemingly destroyed Uri-El with Hellfire. Dolores celebrated only for a few seconds because an interdimensional portal opened behind her and the Wendigo came through with Blaze's children and Jesse Pinto. Dolores and Joy were hit by Wendigo. After Charnel had destroyed the weapons the Blaze and the Punisher Dolores, Joy and Blivet jumped and the defenseless humans to feast upon them. Dolores had her hand around Blaze's neck, but he got hold of Uri-El's sword and cut her in half, destroying her. 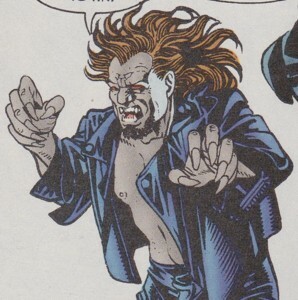 Hairball was a normal vampire with standard abilities and weaknesses. (Blaze II#10) - Hairball told Blivet that Dolores' tattoo was made inside a pyramid during a full moon. Hairball, Blivet and Roadkill then dug up Uri-El's casket and moved it to the demoness Shelob for safekeeping. Afterward he joined the Undead MC on a ride on the New Jersey highway. After Charnel lured Blaze and his allies to the Dark Pavilion Hairball, alongside Blivet and Roadkill, assaulted Blaze's allies Clara, Kody, Princess Python and Wolf outside the pavilion. The vampires received a beating and fled inside the pavilion. 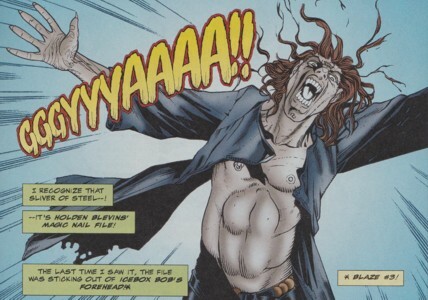 (Blaze II#11) - Hairball, Blivet and Roadkill returned to the Undead MC's hideout and moved Uri-El's coffin to a more advantageous position, but Blivet accidentally broke the coffin's magic seal and released Uri-El, who immediately cut off Hairball's left arm. Shelob contained Uri-El again and remade the seal. Hairball listened to Charnel telling Uri-El's history with vampires. Shortly after Hairball was runer over by the Punisher, who arrived at the Undead MC's hideout alongside Johnny Blaze and Clara Menninger. (Blaze II#12) - Blaze ran over Hairball as well. He soon was back on his feet and attacked Blaze and the Punisher after Charnel had destroyed their weapons, but Blaze got hold of Uri-El's sword (Uri-El had at this point seemingly been destroyed by Johnny Blaze....oops!) and Hairball got cut in half, which was enough to destroy him. Joy was a regular vampire with regular vampire powers and weaknesses, though she was immune to fire. (Blaze II#10) - Joy and Charnel had a look at Dolores' tattoo, which showed Johnny Blaze. Joy and Dolores wanted Blaze's blood and feasted on each other before being reminded by Charnel that Blaze first needed to destroy Uri-El for them before they could slay him. Joy still couldn't await to feast on him and joined the Undead MC on a ride on New Jersey's highways. When Charnel was run over by a van she was concerned he had lost his head, but he didn't. Charnel used the van's driver's blood to lure Blaze and his friends to the Dark Pavilion. There Joy and Dolores waited on a bumper car with Charnel for Blaze, who shot them with Hellfire. Joy, Dolore and Charnel survived and overpowered Blaze. (Blaze II#11) - The Punisher joined the fray and alongside Blaze rained down a hail of bullets on the vampires. Joy ultimately fled with Dolores and Charnel by jumping through the pavilion's windows to get to their bikes. Back at the Undead MC's hideout Joy witnessed how Blivet accidentally released Uri-El while moving the coffin. After the demoness Shelob had webbed up Uri-El Joy and Dolores pushed him back in the coffin. While Shelob remade the coffin's seal Joy listened listened to Charnel, who told the history of Uri-El to the Undead MC. Shortly after the Punisher, Blaze and Clara Menninger arrived. (Blaze II#12) - Joy and Dolores wanted to release Uri-El so Blaze would destroy him, but Charnel reminded them that Blaze had to do it out of righteousness for it to work and they guarded Uri-El's coffin, which Blaze shot at. Uri-El was released and got into a fight with Blaze and the Punisher. The former seemingly destroyed Uri-El with Hellfire. Joy celebrated for a few seconds before an interdimensional portal brought the Wendigo, Blaze's kids and Jesse Pinto to their hideout. Wendigo hit Joy and Dolores. 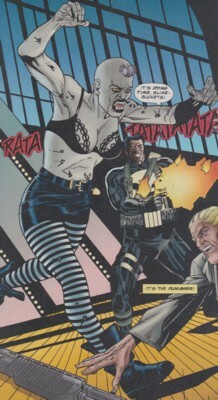 After Charnel had destroyed the weapons of Blaze and the Punisher Joy joined in the assault on their unarmed enemies. Blaze got hold of Uri-El's sword and cut Joy in half, destroying her. 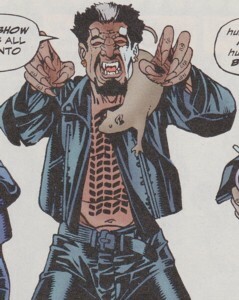 Roadkill had the standard vampire abilities and weaknesses. He liked to carry around a rat. (Blaze II#10) - Hairball told Blivet that an Egyptian sorcerer had made Dolores' tattoo. He then joined Blivet and Hairball in digging up Uri-El's coffin, which they handed over to the demoness Shelob's care. Afterward Roadkill joined the Undead MC on a ride on New Jersey's highways. After Charnel lured Blaze and his friends to the Dark Pavilion Roadkill, Blivet and Hairball attacked Clara, Kody, Princess Python and Wolf outside the Dark Pavilion. The three vampires fled after receiving a beating. (Blaze II#11) - Back at the Undead MC's hideout Roadkill, Hairball and Blivet moved Uri-El's coffin once again under Charnel's orders to a more advantageous position. Blivet accidentally broke the coffin's seal and released Uri-El. Charnel panicked and tossed Roadkill at Uri-El, who stabbed Roadkill through the chest and burnt him with the flames eternal, destroying Roadkill.